"It's pushing through." "What is?" "Something big." A full-length trailer has debuted for a new indie horror film called Unnerved, written and directed by Gary King, an up-and-coming filmmaker who is a friend of this site. The film is about a couple whose child is killed but they still feel his presence. They flee to a remote lake house to escape the unrelenting haunting following them, but (of course) learn that it's still very much with them. Starring Katie Morrison, Mark DiConzo, Elena Sanz and Marty Lang. This looks like it's having fun with the typical horror tropes rather than repeating them, but it's hard to tell where it's all going. Whatever killed their son continues to haunt Mallory and Frank no matter which place they go. While hiding out at a remote lake house, Mallory struggles to keep her sanity and save her marriage as the supernatural activity grows more powerful. Finally reaching their breaking point, they elicit the help of Eleanor, a local clairvoyant, to end the terror once and for all. But will it be too late? 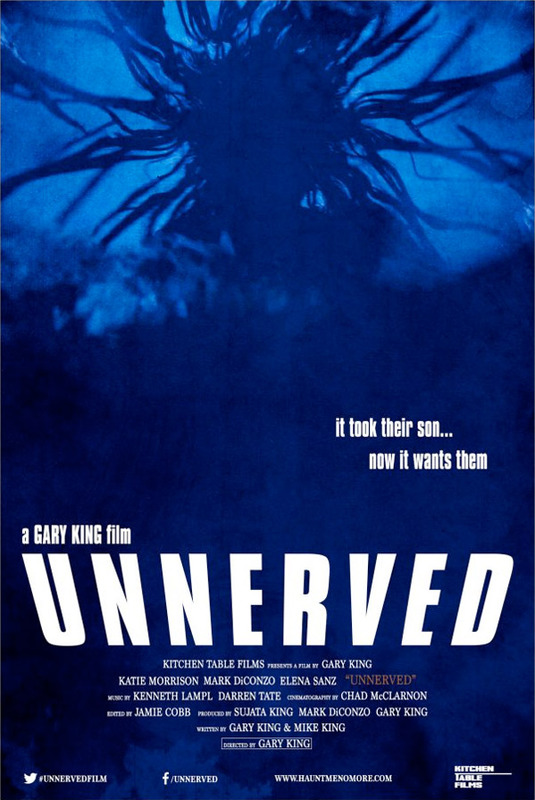 Unnerved is directed by filmmaker Gary King (of How Do You Write a Joe Schermann Song, Death of the Dead, What's Up Lovely, Dismal previosuly and a bunch of short films), from a screenplay written by Gary King & Michael King. The film doesn't have an official release yet. For info, visit their website or Facebook page. Thoughts? This trailer gave me a headache. This feels sort of original, but there's something off. I enjoyed the beginning of the trailer, the tie to the boy's glove and the campy approach by the couple to the investigator. After the investigator states "Analog let's me see in between," the trailer goes down hill. Why reveal the boy is protecting the mother? That's a something to be revealed in the movie. Why the change of tones? The trailer made me wonder who was in control of the film. Are they being chased by debt collectors? The horror.